July 12, 2013. Some global companies in the financial services industry will spend as much as US$9 million on market intelligence* in 2013. While this may appear substantial, they are however, not the biggest spenders. By comparison, some manufacturing and industrial companies may commit as much as US$130 million to market intelligence in a single year. With the millions of dollars that are invested in market intelligence, do industry executives think that the time and resources they have put into intelligence have been useful? 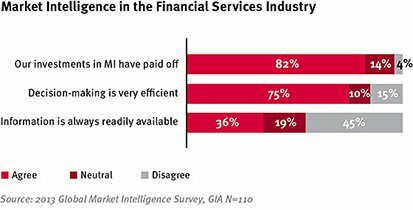 How efficient is market intelligence in the financial services industry? 82% in the financial services industry say their company’s investments in market intelligence have paid off. 75% agree that their “decision-making is very efficient”. However, only 36% say that “information is always readily available”. In a ranking of 20 industries in the study, the financial services industry ranked 10th in terms of their market intelligence capabilities. By comparison, executives in the media and entertainment sectors consider their market intelligence to be very advanced, placing them number one overall, but interestingly; the perceived return on investment (ROI) in these companies is the lowest. The industry with the highest perceived ROI for market intelligence is environment and renewables, where budgets are only slightly higher. The study also shows that large budgets are also no guarantee of more advanced market intelligence functions. For example, medical devices and healthcare companies spend more than eight times as much on market intelligence than financial services companies on average, yet their market intelligence capabilities are ranked 17th in the study. All in all, it appears that more can still be done to raise the market intelligence capabilities at financial services companies, particularly as only 36% of respondents in the industry say that “information is always readily available”. To rise above the competition, industry executives can look to how global companies with world class market intelligence have performed. According to benchmarks used in the research, companies that have the most advanced market intelligence functions have only grown from strength to strength. They have increased the amount of market intelligence delivered directly to their top management to 46% since 2011, compared with only 36% for an “˜average’ company. Such world class market intelligence companies have been proven to be 28% more efficient in decision-making. Their market intelligence executives are also 33% more likely to be viewed as trusted advisors to top management and serve 50% more internal clients using efficient software tools.